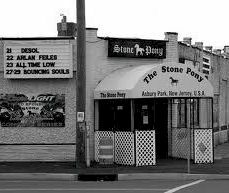 The Stone Pony is an Asbury Park oceanfront landmark which has been honored at the Rock & Roll Hall of Fame. First opened in February 1974, the Pony continues to host the best in local and national talent. With the addition of the outdoor Summer Stage, the venue now holds events for up to 3,500 outside and 800 inside on the classic Pony stage. The The Stone Pony is one of the top New York City venues for concerts and other events. Don't miss some of the biggest names in music as they come to New York City area's The Stone Pony to perform live.